Philip Noyce, Martin Campbell, Antoine Fuqua, McG...a lot of names have been attached to direct Hunter Killer, an adaptation of the Don Keith and George Wallace novel Firing Point. As you probably guessed, with that many names it means this is a project already kinda long in the tooth. Pretty sure it was 2011 when I first started paying attention to it. 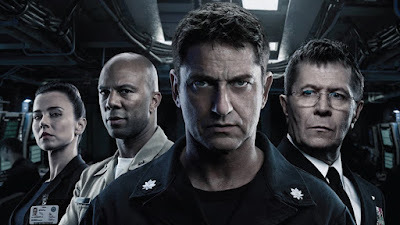 Now all of these years later and suddenly there is a trailer, with Gerard Butler and Gary Oldman all crammed into a submarine. Behind the camera is Donovan Marsh, a South African filmmaker who directed the 2010 comedy Spud, and is looking to make his first big splash stateside. The Tom Clancy-esque Hunter Killer finds a U.S. submarine captain teaming up with Navy Seals to locate the missing Russian president. Along with Butler and Oldman the film's cast is pretty great with Linda Cardellini, Common, the late Michael Nyqvist, and Zane Holtz. For those wondering why it took so long for the film to finally get made, it's a pretty boring story involving Relativity's bankruptcy, and contracts that were set in motion during their struggles. If I had a dollar for every film ruined during that time period...well, I'd have a few bucks on my hands. Given his recent creds it's tough to get excited over Gerard Butler movies. That said, I'm a sucker for a good submarine film and this looks to have the kind of tension I look for in one. Hunter Killer opens October 26th.